Conversations about technology, business, and life. Join Tyler Herrinton for weekly conversations with people from all walks of life as we discuss the impact of technology on our everyday lives. You can also expect some deep dives into the latest tech trends and what they mean for the rest of us. No matter who you are or what you do, technology impacts your life on a daily basis. This podcast explores what it means to live in a technology centered world and how that impacts every area of our lives. From the way that we run businesses, to the way we communicate with loved ones and everything in between. Episode 14: Jordan Jones (Reverse Interview) Everything You Need to Know About Starting a Podcast! In this week's episode we're doing things a little differently! Our guest of the week Jordan Jones, of Pete & Jordan, flips the script and interviews ME all about podcasting! We chat about all the tech involved, my entire process of getting this podcast off the ground, and why you should podcast to begin with. In this week's episode we're chatting with my father-in-law Eddie Edwards. Eddie has been a UPS driver for the past 22+ years and has worked for UPS for over 30 years! In this conversation we chat all about what a typical day looks like, how technology is used as a part of his day to day work, and how he's seen the technology evolve over the past 30 years. This week we're chatting with Davey Jones. Davey recently launched his own podcast "Brands That Book" so I wanted to have him on MY podcast to chat all about why he started his podcast, what that process was like, and how podcasting fits into his overall content creation strategy. 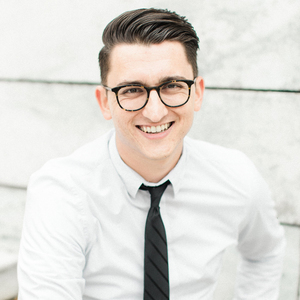 Davey is a super smart businessman who has a lot of great insight into SEO, content strategy and building a strong brand so there is plenty to glean from this conversation. In today's conversation we chat with Catherine about how she got started in photography, how she transitioned into shooting film, and everything you'd ever need to know about getting started shooting film photography! If you've ever wondered about certain aspects of film photography, I probably asked them in this episode! This week we're chatting with photographer and educator Hope Taylor! In this discussion we cover a wide variety of topics including Hope's decision not to attend college, how she uses social media for her business & how she maintains her professionalism online, while still being true to the "real" Hope Taylor. Episode 09: Brent Barkey | What it's REALLY Like to Win Big on The Price is Right! In this episode we're chatting with Brent Barkey about the entire process of winning over $30,000 in prices on The Price is Right! In this week's episode I chat with Megan Kelsey all about the tools she uses uses when traveling to to find the best places to visit, eat and explore while traveling! We swap our crazies travel stories, and talk about our experiences with destination weddings. In this week's episode I discuss one of my all time favorite tech products: Apple Airpods. But in order to fully understand the significance of this product, first we have to go back to the release of the iPhone 7 when Apple changed the way we think about audio by removing a 100 year old piece of technology from phones, launching us into the era of wireless audio. In this episode I sit down for a fun conversation with my wife Ash as we discuss a variety of topics including how we used technology when dating long distance, our thoughts on blogging & Instagram, Ash's love for books & her new BFF Alexa! Episode 05: MoviePass...is it worth it? In this episode I share my thoughts on MoviePass and why I've been loving it. MoviePass is a service that allows you to see 1 movie per day, in the theatures, for only $9.95 a month! On this episode we chat with Brian Goulet, the co-founder and CEO of The Goulet Pen Company. In this conversation Brian and I chat about the origins of The Goulet Pen Company, and how he used YouTube and social media as the catalyst that helped spark the growth of his e-commerce business in a time when social media and e-commerce were still a pretty new concept. This week I'm chatting with photographer and educator Katelyn James. We discuss how she started her career out of her dorm room, the status of blogging in the photography world today, and how she grew her online education business to places she never imagined. Let's discuss the newest drone announced from DJI, the Mavic Air! 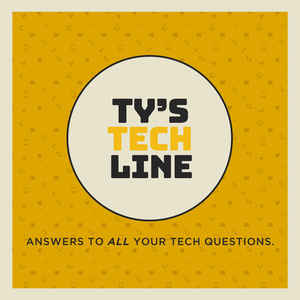 In this first official podcast of Ty's Tech Line your host Tyler Herrinton shares a little of his background, hobbies and how he uses tech in his business. Episode 00: Welcome to Ty's Tech Line! In this non-official first episode I share why I wanted to start a podcast, what you can expect from Ty's Tech Line, and the story behind the name!